pretend the whole thing never happened........ YIKES!!! A very Happy Birthday today to Wayne Agee ('58) of FL! Every time I see someone they want to be added to list so here we go again .... many thanks. No, thank YOU, Gary! And you just keep on running into people; we love adding them to our roles! Clark ('63) for similar favors. In case someone lost me off their mailing list, I am still alive and kicking in Nebraska. WOWZERS! It's good to hear from you, Jim! farthest distance to attend. I believe (okay - I didn't say I remembered EVERYTHING!) you were living in Hawaii at the time. I'll forward your real address on to the rest of the committee. Welcome, Jim! Class of '62 as I am, put me on to the site recently and I am overjoyed at its content. I am a "Northender" and walked 17 blocks to school everyday. replaced and I never heard anything about it. Alvah "Jimmy" Campbell and George "Biddy" Whitehurst were my accomplices in this escapade. Mr. Taylor remains my hero to this day! simultaneously very happy thought, isn't it?!? Let me know if you'd like to have your email addys published to eliminate the middle man (aka ME). "Happy-Happy" when the time comes. We're looking forward to hearing from all of y'all again soon. too, could be one of our happy winners. email would suddenly appear on the screen. I could have read all of theirs, and they could have read all of mine. HO-HO-HO. hotmail account, or even an AOL account. on with a $20 dollar bill anymore! took off his hat, and walked back to where they were sitting and said "Ladies, I would like to introduce myself. of him telling that story! quarter, bus fare was ten cents each way, and if you were lucky enough to have fifty cents you could get a snack. were great for "letting us go"...It never occurred to me that they wanted TO GET RID OF US FOR A FEW HOURS! her...I do not think she believed me...but I sat on my feet for the rest of the movie because we did not want to leave! I was too startled to holler! We never went back to the Langley! 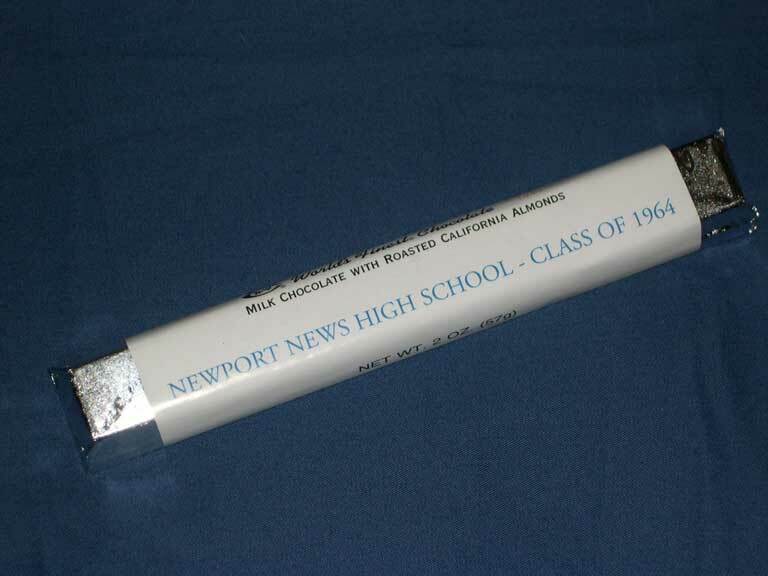 Assuming that everyone else has eaten their allotted bar of Band Candy, then this is the last existing bar. wrapper. I am sure you can find an appropriate place for it among the NNHS 64/40 images. sold every year, and Mr. Wilson wanted the band members to get up and sell them to finance the band's "next trip to Winchester"! What a hoot - but a teary-eyed hoot! Aha! I have often wondered how responses can appear in the same issue as the question. Now, I know!! but only to glean their expertise. called "tapes" then) of the "Junior Club" that was broadcast from the Paramount Theater in the 1930s may be? Sure would appreciate locating them. Carol, you are indeed a cherished wonder. Keep up the good work. WILD GIGGLES!!! Of course, Renee! It availeth me naught to have a Grand Panel of Experts if I do not utilize them! Let's just open this one up to "the class". "Anyone? Anyone?" Thanks, Renee! I appreciate your kind words. of VA, can find practically anything because he's a Super Genius AND he has magical abilities. for a PE class of mine one semester. I just have to tell this on the coach. Agee is the owner of one very dubious, unofficial "world record". In the late 60's a touring professional women's basketball team made a stop in Williamsburg at W&M. Essentially, they were the women's equivalent of the Harlem Globetrotters, and put on a great show. They were called the "All-American Redheads", and played a faculty team, headed up by Agee. GIGGLES! Thanks, Ron! Coach is indeed alive and well, and I have the distinct feeling that Joe is indeed in touch with him. Thanks again, Ronnie - and Joe! Man, what a newsletter. That must take you all day. Carol, honey, when do you have time to do anything else? anything else?!? I don't!!! WILD GIGGLES!!! Seriously, thanks, David; I do appreciate your kind words. Carol -- you may have had this site listed in the newsletter before, but I don't recall seeing it: http://www.thestatenislandboys.com/U_thrill_me/index.htm. to stash and keep such things as this, but I've never figured out where that might be. I'm open to suggestions. granddaughter Arielle that I am so blessed to see on a daily basis. I hope that this finds you well. Thanks for putting a smile on my face and others too. And yes, I'm having fun, too! I still think I'm in a dream world somewhere, but I'd rather not awaken!